294 pages | 13 B/W Illus. The goal for ergonomics has always been to adapt work, work environments, and machines to humans. But is this goal still sufficient? Does it satisfy the needs of the individual or of societies and organizations as they operate now? Constructive Ergonomics provides an answer to these questions. Rooted both in the academic world and in the world of practitioners of the domain, it details a constructive, developmental view where ergonomics seeks to eliminate the factors and conditions that impede performance and development. This book advocates that ergonomics cannot remain content with a limited and static view of adaptation, a view that would restrict its goal to designing systems that are suited to work as it is defined at a certain point in time, to workers as they are at a particular moment, and to organizations as they operate here and now. 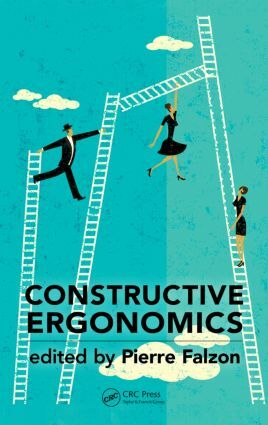 Author Pierre Falzon argues that the objective of ergonomics must be the development of individuals, based on setting up situations of action that lead to increased success and to the acquisition or construction of know-how, knowledge, and skills. The global framework presented in this book revises profoundly the goals of the discipline, elucidating a novel approach to work, health, and performance shored up by integration models from economics and management theory. An exploration of an innovative, developmental view of ergonomics, the book redefines the ambition of the discipline and describes the elements of its scope. It provides a solid and new conceptual background and methodological tools for intervening in real-life contexts. "… many outstanding ergonomists in this book described the potential possibility and novel direction of developing ergonomics using these two key words, namely "Constructive" and "Development", which differ their view points from the traditional scopes of ergonomics. It could be expected that this book would have a strong impact and throw new lights upon the future of ergonomics, for not only experts but also students in the field of ergonomics and design." Constructive Ergonomics: A Manifesto. Resources and Conditions for Development. The Development of Skills: A Condition for the Construction of Health and Performance at Work. The Development of Collective Activity.The Development of the Psychosocial Dimension of Work. From the Adaptation of Movement to the Development of Gesture. From Constrained Time to Constructed Working Time: Towards an Enabling Organization of Work in Rotating Shifts and Night Shifts. Activity as a Resource for the Development of Work Organizations. Constructing Safety: From the Normative to the Adaptive View. Courses of Work and Development. Dynamics of Action and Dynamics of Development. Interventions as Dynamic processes for the joint development of stakeholders and organizations. The design of instruments as a Dialogical Process Of Mutual Learning. From Use Analysis to the Design of Artifacts: the Development of Instruments. Prevention of MSDs and the Development of Empowerment. Design Projects as Opportunities for the Development of Activities. Reflective Practices and the Development of Individuals, Collectives, and Organizations. Co-Constructive Analysis of Work Practices. Auto-Analysis of Work: A Reflective Tool to Support the Development of Skills.